Nigerian Women’s Bobsled Team Ngozi Onwumere, Akuoma Omeoga and Seun Adigun pose with flowers upon their arrival in Lagos, Nigeria, as part of preparations ahead of the 2018 Pyeongchang Winter Olympic Games, February 1, 2018. Nigeria’s Bobsled and Skeleton teams participated in the Winter Olympics for the first time at the 2018 Pyeongchang Games in South Korea. The trio of Seun Adigun, Ngozi Onwumere and Akuoma Omeoga who participated at the event took the 20th position in the women’s category. In an Interview from Pyeongchang on telephone, Elegbeleye, however, described the performance of the athletes as “simply amazing’’. “Being among the 20 best in the world in bobsled and skeleton is quite amazing, considering how and when the girls started preparations for the Winter Olympic Games. “Jamaica started bobsled close to 30 years ago and they were unable to finish the race in their debut participation. “You can remember that Reggae legend and music icon, Bob Marley composed a record for the Jamaican bobsled team (cool running) then. “The Nigerian girls did not only finish their four races, they recorded their personal bests in two of the races,’’ Elegbeleye said. The former director-general of the National Sports Commission, added that the Nigerian athletes were the centre of attraction in the 2018 Pyeongchang Games. “South Korea, the host of the Games with some of the world leaders and the IOC President, Thomas Bach, said the hoisting of Nigeria’s flag at the competition was a trailblazer. “The Prime Minister of Norway, Erna Solberg, had a special session with the team. It shows Nigeria is a country of talents and achievers. “I hope this will spur other young Nigerians to aspire for greater heights,’’ Elegbeleye said. He also said that the participation of Nigeria in the Games was also a good diplomatic feat. “Sports participation is the greatest tool for diplomacy in building world peace and global unity. “It shows that sports are a unifying factor and certainly what politics is unable to achieve, sports will surely do. “This is demonstrated by the Korean people as both the North and South Korea presented a joint team to the Games,’’ Elegbeleye said. The athletes had at long last attained their goal at the Games, which is to raise awareness and possibilities of Nigerian and African participants at future Winter Olympics Games. Simidele Adeagbo, (skeleton), Adigun, Onwueme and Omeoga (Bobsled) featured for Nigeria in the 2018 Pyeonchang Winter Olympic in South Korea. 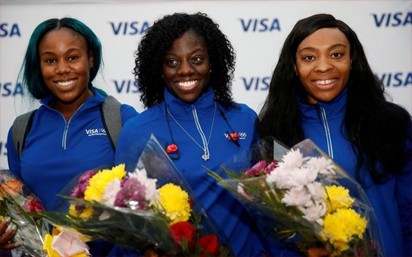 The post Pyeongchang 2018: Nigerian athletes performance simply amazing — Elegbeleye appeared first on Vanguard News.